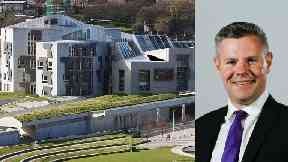 Labour's finance spokesman James Kelly said MSPs should reject the draft tax and spending plans. Scottish Budget: Calls to reject Derek Mackay's draft plans. The minority government needs support from another party to pass its draft tax and spending plans on Thursday but Labour's finance spokesman James Kelly said all opposition MSPs should vote to send finance secretary Derek Mackay "back to the drawing board". He said: "Derek Mackay's budget is not fit for purpose in its current form. It hands a tax cut to high earners while cutting funding for local services and threatening jobs. "This budget will not be improved by tinkering around the edges. It needs significant change, such as a 50p top rate of tax to ensure top earners pay their fair share to fund our public services. "We need to send Derek Mackay back to the drawing board and that means every party voting against the proposals on Thursday." The Scottish Greens have backed the minority administration's Budget for the last two years but have called for a fundamental change in the SNP's position on council funding, saying the current proposals are "hugely damaging" and would lead to cuts in local services - calculated by the Scottish Parliament Information Centre (SPICe) at £319m. The Conservatives and Liberal Democrats have ruled out backing the 2019/20 Budget unless the SNP drops plans for a second Scottish independence referendum. Since devolution, Holyrood has voted down the Budget once, in 2009, but after then first minister Alex Salmond threatened to call an election, MSPs passed the tax and spending plans the following week. A Scottish Government spokesman said since 2009 Holyrood has gained tax powers and "to enable taxes to be properly collected, this has to go through". Questioned if there would an be election if the budget is falls or if this has been ruled out, he said: "We're not talking about an election, we're talking about getting the Budget passed." He added: "Frankly, I think people across Scotland would be astonished if they saw opposition parties playing political games in a way that jeopardised frontline funding for schools, hospitals and everything else." The spokesman said the government is "intent on getting a deal done that will see the budget pass at stage one" on Thursday. "It's imperative that we do see progress on the Budget, this would be true at any time but at a time like just now when we have the maximum amount of Brexit uncertainty, it would be unconscionable for parliament to vote down the Budget," he said. "We're always optimistic. There's the potential for agreement to be reached but we're not there yet." The Budget includes an additional £730m investment in health services and £180m aimed at boosting attainment in schools - with £5bn of capital investment including £1.7bn spending on transport infrastructure and a £50m town centre fund to support struggling high streets. Tax changes proposed will increase differences between Scotland and the rest of the UK. From April, taxpayers south of the border will only pay income tax at the 40p rate if they earn more than £50,000 a year - while in Scotland it is proposed people will pay the higher rate of 41p on earnings above £43,430.